That good news/bad news thing is difficult to figure out in this most unusual of Bulls seasons when a win can be a loss and a loss a win. 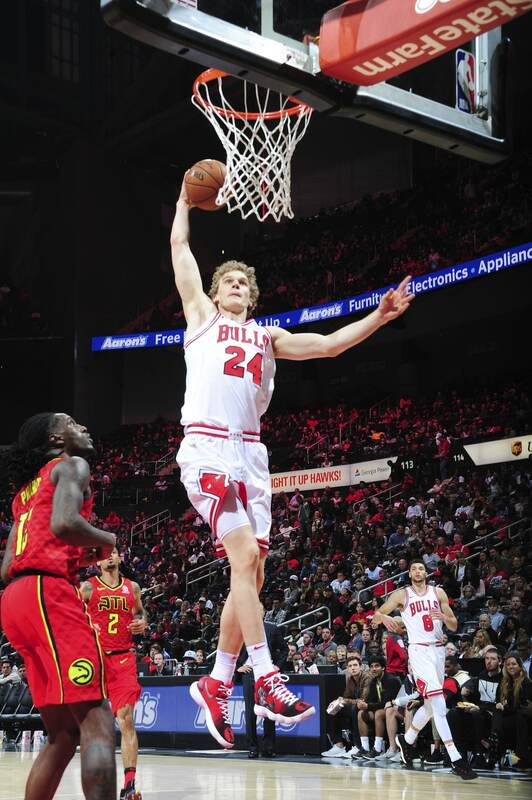 The Bulls Sunday defeated the Atlanta Hawks 129-122 to end an eight-game road losing streak, which was good news. 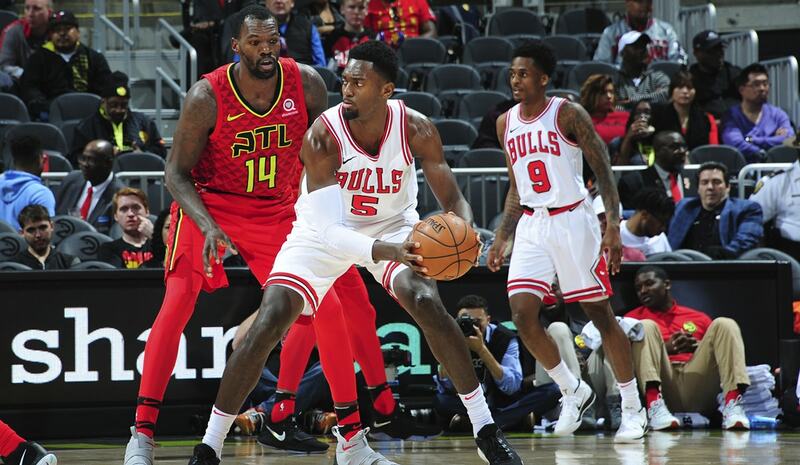 But with a season sweep of the Hawks—which happened also to be the Bulls last road win Jan. 20—the Bulls, at 23-43, moved within a half game of the Knicks and the ninth most odds for a better draft pick. That would be the bad news. The Bulls had seven players score in double figures led by Bobby Portis and Zach LaVine, each with 21 points. Lauri Markkanen added 19 points. Which would be good news. 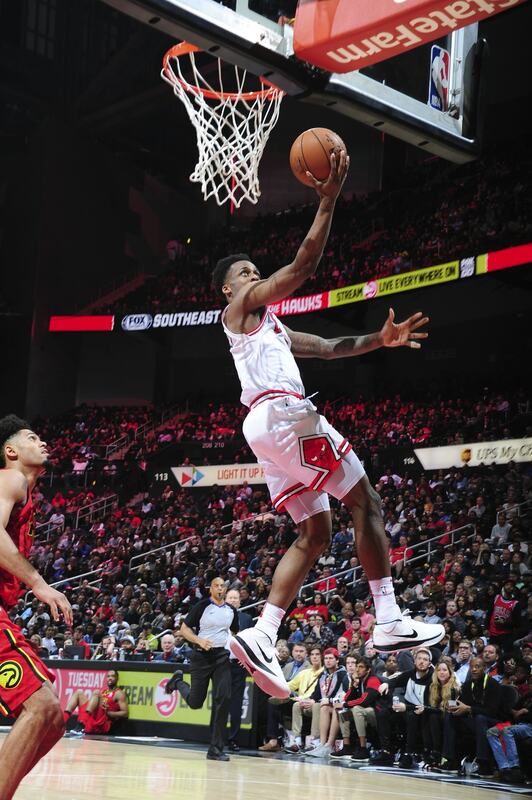 Except that the starters again began the game poorly and were carried to the win by the reserves with Portis adding 10 rebounds and five assists, Denzel Valentine getting a team most seven assists, Antonio Blakeney scoring 14 points and Cameron Payne contributing one fewer assist than Kris Dunn. Twenty of the team’s 31 assists came from the reserve players. Which is not really good news. Plus, every Bull starting player had a minus ranking in the game while every reserve has a plus. Payne was the best in a sentence never written since college with seven points, four assists, two steals and zero turnovers for a game high plus-24 margin. After that miserable first quarter in which the Bulls trailed 34-20, the second unit turned the game around, though it helped that it was the deep bench players from the last place Hawks. Still, that Bulls second unit came into the game with more activity on defense, more haste on offense with much less waste. With nine second quarter points from Portis and seven from Blakeney after he lead the G-league in scoring, the Bulls took a 53-50 halftime lead. Valentine had 12 points, seven assists and six rebounds and Noah Vonleh had another good game with eight points and eight rebounds in 19 minutes with a plus-20 ranking. He, Portis and Payne all were plus-20 points for the Bulls. The bad news is none are mentioned as a Big Three. It’s not inconceivable that the three primary players, LaVine, Dunn and Markkanen, have been wearing down some since they have been on the diet of regular play with the lineups and rotations constantly changing around them. This time Justin Holiday got a holiday. He didn’t play. Robin Lopez in the NBA-suggested starting lineup started again and played just the first quarter. Cristiano Felicio started the second half for Lopez. David Nwaba started and was the best of the starters, or at least, least worse with just a minus-5. Nwaba had 10 points and two of two on threes. Nwaba is eight of 12 on threes since the All-Star break—we know what he did in that last summer-like break—and he was in the middle of several crucial runs, especially in that third quarter when the starters began to pressure the ball and deny the space for shooters. It seemed fairly obvious that Hoiberg counseled that starting group at halftime since they came out with much more purpose on defense. The defensive help and rotations were awful to start the game, Hawks shooters on the way to 19 threes and lonely on the perimeter as Hoiberg not only had to call the first timeout, but the first two as the Bulls trailed 15-8 and then 24-8 with 5:10 left in the first quarter after a 13-0 Atlanta run. Yes, your 20-47 Atlanta Hawks without Dennis Schroder. No word yet on an NBA-inspired lineup change for Atlanta. Schroder supposedly had an elbow problem. Must have been from poking his elbow into a teammates’ chests and winking. That third quarter seemed to produce a revived attitude among the Bulls starters. Markkanen went on to score 17 of his 19 points in the second half with LaVine adding 12 with three assists. He and Markkanen combined for eight free throws in the last minute of the game after Taurean Price with 38 points got the Hawks within three points with a three. Back to that third, Nwaba had a steal, drive and wonderful assist to a dashing Markkanen for a slam dunk late in the quarter for a 78-73 Bulls lead. Earlier in the third, Dunn had the highlight play with an over the head half court bounce pass on the run for a Nwaba dunk following Nwaba and LaVine threes. That sequence likely thrilled Hoiberg because the Hawks called the inaugural second half timeout about three and a half minutes in with the Bulls leading 69-58. The pivotal stretch for the Bulls was to close the third into the fourth and that gave them enough space to hold on for the win. Yeah, good news. 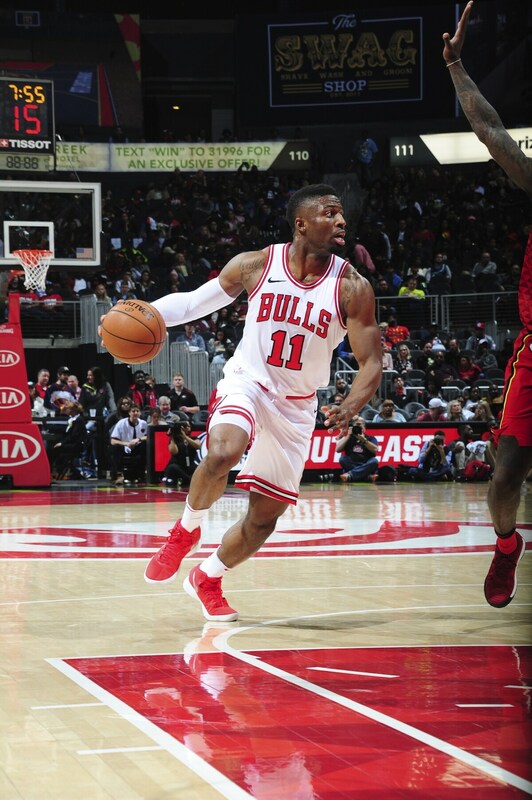 With the Bulls leading 89-85 with four seconds left in the third quarter, Portis rebounded and dribbled all the way for a score and six-point Bulls lead after three quarters. Then to open the fourth quarter it was Portis with a three. “Bobby was terrific all game long knocking down shots for us,” said Hoiberg. Blakeney then made a steal in which he then cleverly tapped the ball ahead to himself on the run and made a brilliant fake and athletic finish. Blakeney doesn’t do a lot of other things, but he can score when he gets going. Vonleh made a three on a Valentine assist and then Portis took a pass, stepped in on his defender and as the defense reacted passed to Blakeney for a three. It was the kind of ball movement Hoiberg noticed was too often missing with the starters to start. That Blakeney swish made it 105-92 Bulls with 9:08 left in the game and enough margin to avoid much letdown. Though the free throws were needed along with both LaVine and Dunn in the last minutes scoring on powerful drives and aggressive finishes at the basket after earlier in the game fading or flipping or trying to reverse the ball. “Good experiences for our young guys to be in those types of situations,” said Hoiberg. So the Bulls youngsters did come through at the end, though their pattern to start games since All-Star break has been habitually lax play without much cooperation. The starting lineups have been different even from half to half, though the defense hasn’t been as attuned until Hoiberg’s halftime reminders. So they do care. Otherwise, it would be the same in the second half. The Bulls finished 17 of 37 on threes with 49 percent overall shooting. Half of Portis’ 10 rebounds were offensive as the Bulls had a 21-0 mashing on second chance points and 21-9 on fast breaks. Definitely, good news. Atlanta shot 51 percent and made 19 threes. Which was not so good news. Hoiberg did experiment with Markkanen and LaVine each running the offense out of the backcourt at times. LaVine did so late in the game and often seemed more involved with the ball in those sequences. Yes, that was more good news and a happy ending.